The only place in the world that tall rainforests grow on sand dunes. This World Heritage listed Island is a precious part of Australia's natural and cultural heritage, protected for all to appreciate and enjoy. 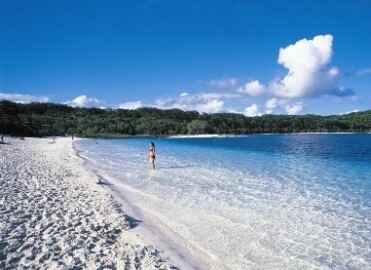 Fraser Island stretches over 123km in length and 22km at its widest point. The lslands World Heritage listing ranks it with Australia's Uluru, Kakadu and the Great Barrier Reef. It is a place of exceptional beauty, with long uninterrupted white beaches flanked by strikingly beautiful coloured sand cliffs and over 100 freshwater lakes. On this 6 day tour, visit the Champagne Pools, Indian Head and Maheno Shipwreck by 4 wheel drive on the beach. Search for migrating humpback whales on a Whale Watch Cruise in the Hervey Bay National Marine Park. Watch the sunset at Jetty Hut. Marvel at the wonder that is Lake Mackenzie, perched high in a sand dune 100m above sea level. Take in the historic heard of Fraser Island, Central Station the original headquarters of the islands forestry operations. 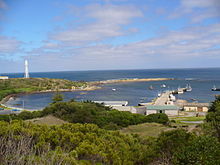 At the western entrance to Bass Strait lies an idyllic place known as King Island. An island rich in history, with shipwrecks, lighthouses and jagged reefs, bountiful with long stretching sandy beaches and lush green pasture. This little paradise produces some of Australia’s finest natural foods for which they are best known including beef, cheese, crayfish & abalone, yet there is more to this 64km long by 27km wide stretch of land than first meets the eye. Windswept and rugged - beautiful scenery with a fascinating history! Join us for a wonderful short getaway to beautiful King Island. On this 4 day tour, on a tour of Currie, learn about the shipwreck heritage of King Island, graveyard of at least 60 ships over the past two centuries. Visit the Kelp Works, an integral part of the King Island economy. Experience sensational scenery, plentiful wildlife and amazing shipwreck stories on our way to the top of Cape Wickham. Taste some of King Island's special cheeses at the King Island Dairy. Take in the Hybrid Power Plant, that energises King Island on its own grid, plus more.